The ship, not the pub! Thanksgiving falls on the fourth Thursday in November, and celebrates the survival of the Pilgrim Fathers through their first winter in America. 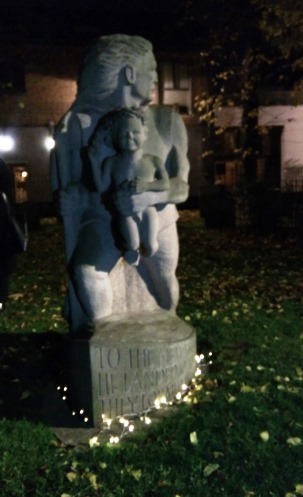 This year the community in Rotherhithe celebrated Thanksgiving with a commemorative event, which I went to, and are looking ahead also to 2020, the 400th anniversary of the sailing of the Mayflower. So I thought I might write a bit about Rotherhithe’s links with this historic event. The Mayflower, which was built in Harwich, sailed from somewhere near where the Mayflower pub is now. She was an old ship, built to carry cargo, so there were no cabins and hence no privacy or light in the hold. Originally it was intended that two ships would make the voyage. A group of religious separatists who had been living in Leiden in Holland travelled on the Speedwell, and sailed with the Mayflower from Southampton in August 1620. But the Speedwell was leaking so badly that they had to return, and everyone crammed into the Mayflower, which then set sail from Plymouth on 6th September. So the ship was overcrowded, and also left very late in the year. The captain of the Mayflower, Christopher Jones, who was also part owner, was born in Harwich, but by 1620 was living in Rotherhithe. Several of the crew are known to have come from Rotherhithe, although only one, the First Mate John Clarke, is known by name. The ‘Saints’, as they were called, were Puritans who wanted to live according to how they believed Christians had done in the early church, following the bible strictly. They wanted religious freedom, which they could not have in England – but not religious toleration. There were also many other passengers on the Mayflower, including servants of the Saints, and also ‘Strangers’, people who were looking to make a new life in America. The venturers who financed the voyage were hoping to make money out of it. The voyage took 65 days, but when they arrived off America, it took them nearly two months before they actually found a suitable place to land permanently, on 21st December 1620. They were very short of food and firewood, and surviving the winter was very difficult. Christopher Jones and the Mayflower stayed through the Pilgrims’ first winter, leaving only in April 1621. The ship returned to Rotherhithe on 6th May 1621. Captain Jones died soon after, and is buried in St Mary’s churchyard, and there is a memorial to him there, although it is not recorded exactly where he is buried. The present church is not the one he and the Pilgrims would have known, as it had to be rebuilt in the early 18th century. But St Mary’s has many connections with the sea, memorials to sailors, and furniture made from the timbers of the Temeraire, made famous in Turner’s painting. It is thought that the Mayflower was probably broken up in Rotherhithe. 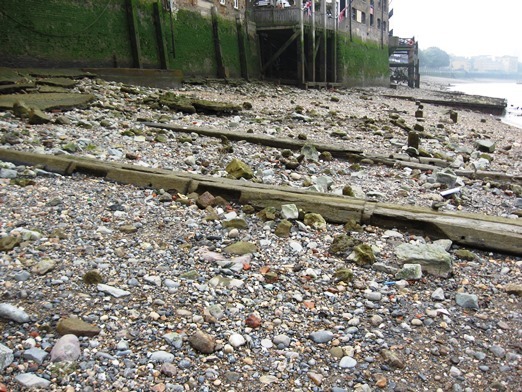 As the FROGs know, the Rotherhithe foreshore has plenty of evidence that ship breaking continued there into the 19th century, with a gridiron, and many examples of reused ships’ timbers. Are we going to find a bit of the Mayflower – probably not! Mayflower 400 is the organisation planning the celebration that will be held in 2020. Thirteen places are developing a joint programme, ten of these being locations in the UK, including Rotherhithe, two in the USA, and Leiden in the Netherlands. The plans include a Mayflower Reunion, which considering that 28 million Americans are descended from the 23 Mayflower families, could be quite a thing! In Harwich they are hoping to build a replica of the Mayflower and sail it to America. Southwark’s ambitions are more modest, but they hope to increase tourism to the Rotherhithe area, to educate young people about the Mayflower voyage, and encourage cultural activity. 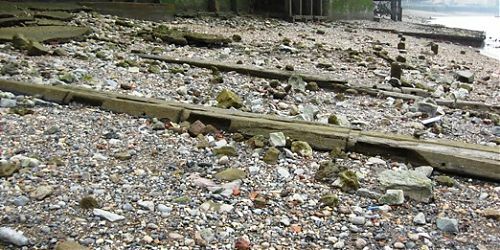 In fact Southwark’s website asks for ideas for exhibitions, talks, walks, and any other activities to involve the local community in celebrating Rotherhithe’s connection to the Mayflower and the history associated with it. Maybe this is something for the TDP to be involved with? It’s well worth looking here for a good account both of the Mayflower, the Pilgrims, and current plans.